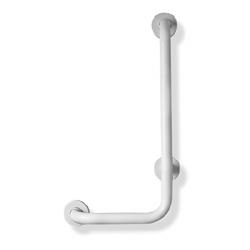 ADA compliant L-shape safety support made of corrosion resistant, zinc coated steel with an extruded plastic finish. Available in white, ivory, biscuit, grey and black. 1-1/4" Dia. Please allow 2 day lead time for White (W1). Please allow 4 to 6 week lead time for all other colors.